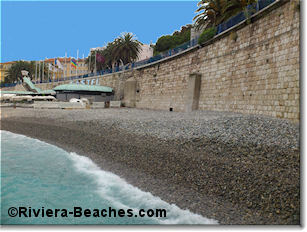 All the way to the east is the Bains de la Police beach which is a small punctuation point of a beach east of Castel. The waves have not been kind to this beach which narrows each year. Although it was once reserved for the police, it is now open to all. Swimming can be perilous here particularly when the waves pound against the rock. Walk past Castel beach on the Promenade and you'll see a sign for the Bains de la Police beach and stairs leading down to the rocks. There's no safe access to the water to your left as the jagged rocks form a forbidding wall. To the right a short path leads to a pavillion. Steps on the other side lead down to the beach but it would be inadvisable to cross the pavillion under heavy seas as part of it is not barred. Next to the pavillion is the entrance to a tunnel that was dug during WWII as part of the defense of the eastern part of Nice. There are no beach showers on this beach.